Monday we went to Little Bit’s baseball game and there’s nothing quite like watching kids that are beyond excited, play baseball. We play in the Miracle League. It is a league that takes kids of ALL abilities. It is the most wondrous thing I believe I have seen. There are kiddos in wheelchairs, walkers, and kiddos running like there’s no tomorrow. They are just so happy! Some of them run base to base, like in a regular game and some just go for it, bypassing everyone and scoring each time they get it hit! I just LOVE that! I have been thinking about the story I wrote yesterday called “Being You on a Tuesday”. If you’ve had a chance to read it, you know I have what I like to call “walls on standby”. Well, I had a wake up call of sorts a couple of months ago while we were on vacation and knew then that I needed to work on getting rid of those bricks. Because here’s the thing, as parents we try to protect our kiddos. And, what I’m realizing is if I put bricks up around me, there’s a pretty good chance he’s in there with me. So, our first real family vacation was at beach house on Dauphin Island in Alabama. On the north side of the house was Mobile Bay and on the south side was the Gulf of Mexico. We chose that particular house because it was on the bay side and had calmer seas. My husband on the other hand was happier than I had seen him in forever! He was jumping in the waves, riding them, getting knocked completely over, and joy was just radiating around him. He was laughing out loud and smiling. Same for my son! He was having a ball! We stayed a few hours and then returned to the beach house. I was EXHAUSTED! Later that night I started to think about some things. Maybe it’s not such a good idea to be in self protection mode all the time. Sure, it keeps us safe, but are we missing out on things? What if we’re missing out on pure joy? New relationships? New friendships? New life experiences? New opportunities? Not only that, but all of those things are missing out on us. On OUR light. On OUR amazing-ness. So, what did I do? The next time we went to swim in the Gulf, I stood BESIDE Little Bit and BESIDE my husband. I held their hands and I let the ocean knock us down. I got sand in my hair. I laughed wildly. We all did. Letting go of control and the feeling of being safe is hard. Knocking down those bricks is a bit scary. But, I feel we owe it to ourselves to try it. I stepped over fear quite a few times during our vacation. Little Bit and I even parasailed 400 feet in the air behind a boat! That, and standing in those waves are among the most freeing things I have ever done. 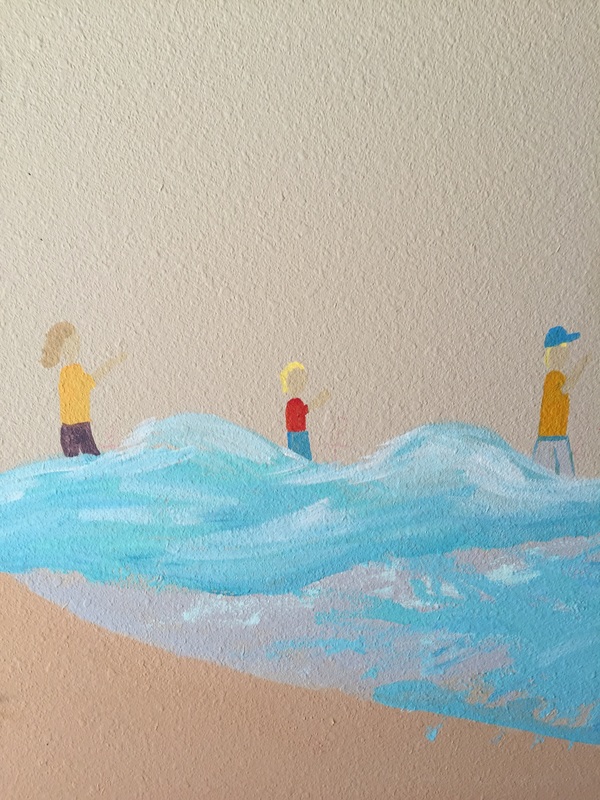 When we got home we painted a mural of our vacation on our wall. Every day I am reminded that there is an opportunity for joy in every instance. I hope you give yourself a chance to see it, to really feel joy. And perhaps like the Miracle kids, when you get to 2nd base you won’t get stuck where it’s safe. Instead you’ll keep on running for home.